Valerie Cristo from Clay for a Cure makes some gorgeous raku pieces and recently made some custom focals for me. I can't say enough about how great she was to work with on my order. She took the time to figure out what I wanted and why and was able to suggest some ideas I hadn't even thought of. And if her pretty beads and customer service isn't enough, she donates a portion of each sale to help find a cure for cancer. Do take a minute to check out her shop - you won't be sorry! After waiting out by the mailbox for a few days, I was thrilled when my beads arrived. Just look at the COLOR! It makes my heart beat a little faster, I swear! 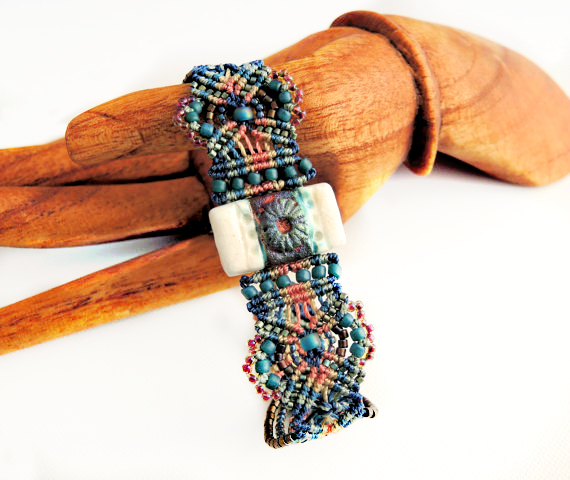 And it has been such fun pulling the colors from her beads and weaving them into intricate micro macrame bands. For the first couple of bracelets, I chose some of the rectangular pieces from Valerie. 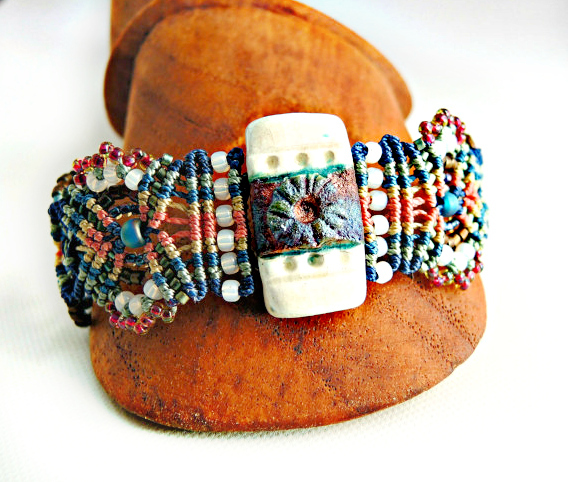 I love how she used the raku colors in a band across the center and left the rest a glossy white for contrast. I started with a mix of blues, khaki and a coppery pink, then added a bit of white to the next one. 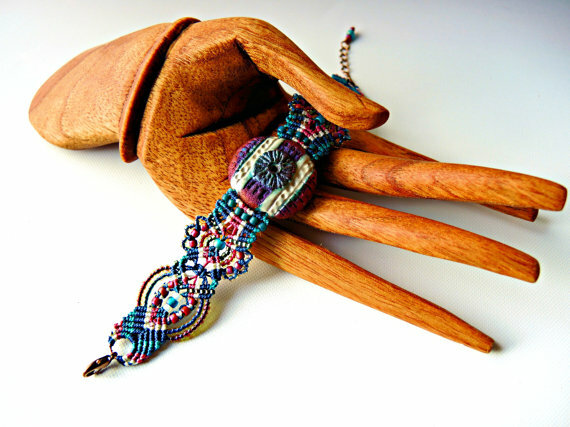 When Valerie saw them, she asked me to design one for her using the large round bead she made for me! I don't think there's any greater compliment a jewelry designer can receive than to be asked to make a piece for a bead artist using one of their beads. And what's better? Now Valerie is standing out by her mailbox waiting!